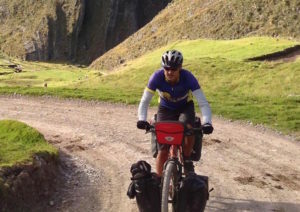 An Atascadero man emerged victorious in a rough-terrain cycling race from Canada to a Mexican border town in New Mexico. Brian Lucido, 41, finished first on Saturday in the 2017 Tour Divide, an approximately 2,750 mile race. The mountainous route begins in Alberta Canada and ends in Antelope Wells, New Mexico along the United States-Mexico border. Lucido finished with a time of just under 15 days and an average of more than 180 miles a day. He aimed to complete the course in 18 days. As of Monday morning, only two participants other than Lucido have finished the race. Before the race began, Lucido stated on Facebook that only about one third of participants manage to finish. “Typically, only 33 percent finish – and this year is much more difficult than recent years with lots of walking in the snow, and a couple extra passes and rocky mileage to go around a washed out bridge,” Lucido wrote. Congratulations, what a wonderful accomplishment. I don’t know the guy, but I know what it takes to accomplish a feat like this. Congrats and kudos to him!